Isosceles Triangles! They are so exciting, and yet simple. 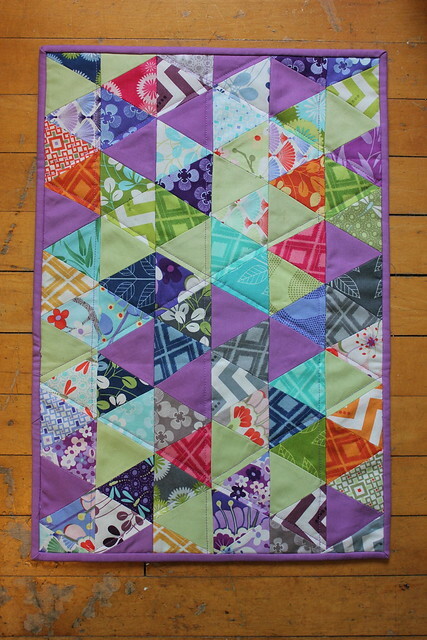 Here are some excellent triangle quilts to marvel at. Please follow the links to the projects' blog posts for more pictures and details. 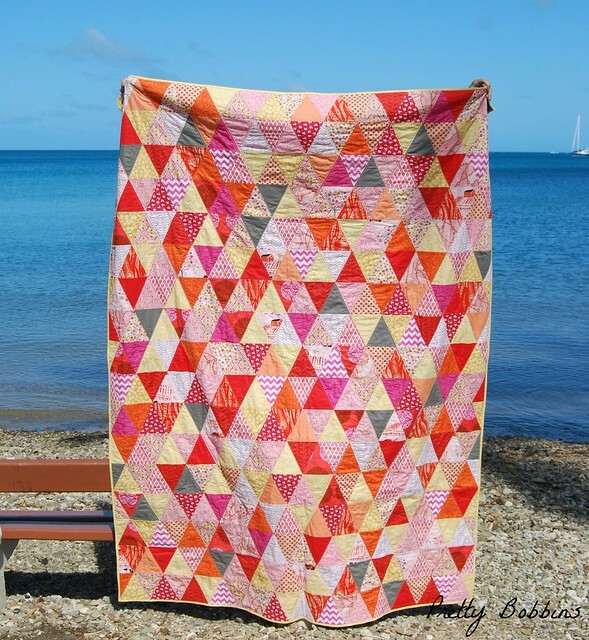 Gemma at Pretty Bobbins made this gorgeous quilt from a blogger bundle and some stashed fabrics.I just adore these sunny colors! 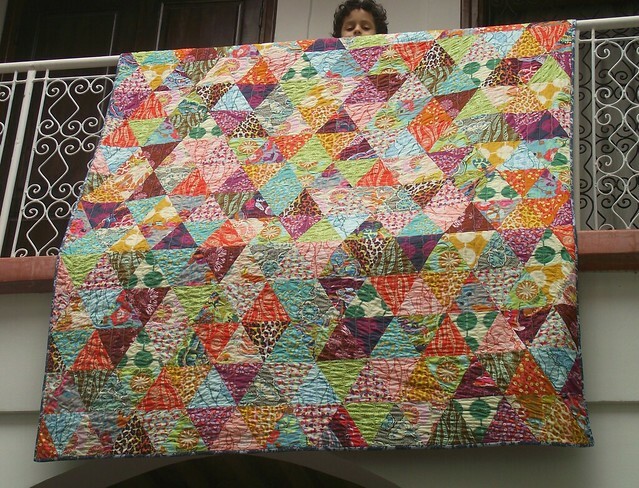 Annabella of Life's Rich Pattern made this luscious quilt from Anna Maria Horner's Field Study line. I could just stare at this one all day! Lynn Harris of the Little Red Hen made her Swiss Chard Quilt with a different blogger bundle, and using Elizabeth Hartman's Honey quilt pattern from the book Modern Patchwork. I see a couple of Tula Pink prints in there, as well as one of my favorite all time blenders, Violet Craft's Haystack print. Jessica of Euphoria made this whimisical chopsticks quilt with quite a few Lizzy House prints, among other fantastic fabrics. The pattern is Chopsticks by Julie Herman of Jaybird Quilts. Speaking of Julie Herman, Emily of EmmmyLizzzy used her Hex N More ruler to make the imfamous Guady Kitty Quilt for her cat obsessed daughter. Instead of random triangle placement, she chose to put them in rows. It was then quilted by Pink Castle's own preferred longarm quilter, Kathy of Thread Bear Quilting with an all over cat motif. I spy some Heather Ross fabrics in with all those cats! It's funny how different the triangles look marching left to right rather than up and down, isn't it? I hope these give you some inspiration about trying out triangles, or new color combinations. Whatever you make, whatever shapes you use, we'd love to see your finishes in the Made with Pink Castle Fabrics Flickr group. 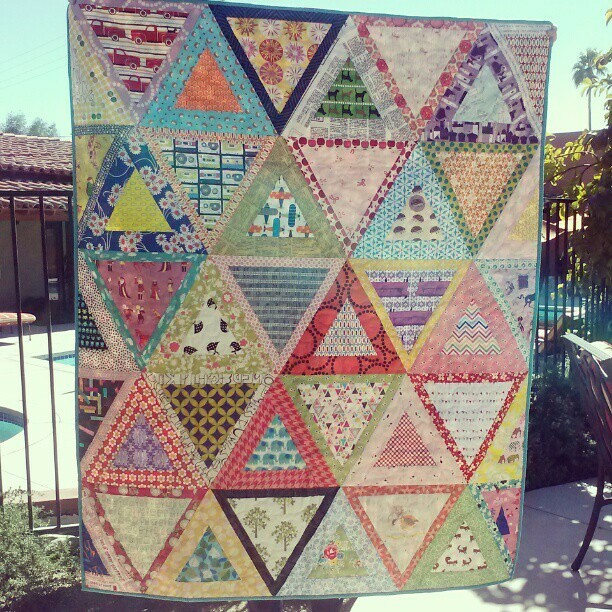 You can even find my triangle quilt there!